Buffer Zone: Does a 35-foot space hinder free speech? 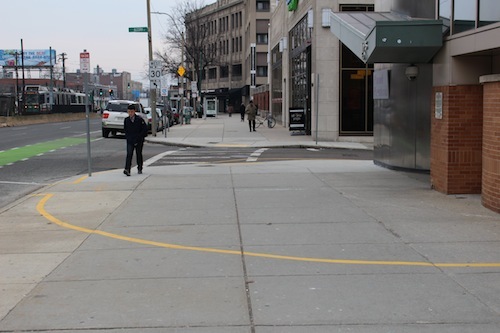 On the sidewalk in front of the Allston branch of Planned Parenthood, a bright yellow line paints a semi-circle 35 feet from the fortified entrance. Pro-life protesters must stay behind that line, thanks to a 2007 state law enacting a "buffer zone" at women's reproductive health facilities. On most days, the only visitor is a 77-year-old grandmother who quietly counsels women out of their choice to get an abortion (sometimes successfully). She is Eleanor McCullen, and she sued Massachusetts, claiming the line violates her First Amendment rights. The Supreme Court heard arguments on both sides this week. The state says the line safeguards patients and employees, who have faced violent protests, blockades, and two murders in 1994. Earlier attempts to keep the peace -- such as a faded white line, 18 feet from the door -- were ineffective. And 35 feet is close enough to hear a person speaking at a normal volume. (Boston.Comment tested it). The Supreme Court itself has a buffer zone, as do reproductive health centers in Colorado. Do you think a buffer is necessary to protect reproductive rights? Or do you consider the Massachusetts law an assault on free speech? Read the opinions below -- some of them might surprise you -- then add yours to the comments, or tweet us @BostonComment. I am pro-choice. I do not think women should be verbally harassed, intimidated or threatened when they are exercising their constitutional right to seek an abortion. But the buffer zone bothers me. On one hand, it is just a line on the sidewalk. It doesnâ€™t stop free speech; it keeps it within shouting distance. But once society starts drawing those lines, where does it stop? What other speech do we want restrain? Demonstrators at political conventions are routinely confined to separate â€œprotestâ€� pens; they are carried out bodily from other political events. Under a recently enacted regulation, the Supreme Court now bars most demonstrations from its front plaza. The buffer zone may keep the bearer of unpleasant views 35 feet away. But if the ultimate goal is to prevent violence, no one should be fooled into thinking a line on the sidewalk is any match for a determined assailant. The Supreme Court has a long history of allowing curbs on free speech in order to maintain public safety â€” think shouting â€œfireâ€� in a crowded theater. John Salviâ€™s fatal shooting spree at two Planned Parenthood clinics in Brookline in 1994 should be evidence enough that both patients and abortion providers need added protections. Such restrictions must be applied neutrally, and other channels of communication available, but the Massachusetts law allows both. Anti-abortion picketing still goes on, just 35 feet away from clinic entrances. And should the day arrive â€” as unlikely as it sounds â€” that abortion opponents are as under threat as those exercising their right to safe and legal reproductive care, the buffer zone law will be on hand to protect them, too. The 2007 law promotes two vital public interests â€” safety and access to medical care. The buffer zone minimally restricts the freedom of protesters and is justified by a lengthy and unfortunate history of obstruction and violence at these facilities. Based on existing First Amendment cases, this type of reasonable regulation should be easily upheld. Those who don't trust women to make their own health care decisions are emboldened by the courts and state legislatures that continue to erode women's constitutional protections. A buffer zone won't stop a hail of bullets should another anti-choice terrorist go on a shooting spree. The McCullen v. Coakley case is complex and can provide lawyers, and advocates on either side, plenty of opportunity for argumentation, often verging into obfuscation. But the core is simple. The state legislature and federal courts in Massachusetts have determined that one particular brand of speech â€” speech seeking to convince women not to have abortions â€” should be subject to limitations on the speakerâ€™s ability to effectively deliver his or her message. There can be no doubt that lack of the demonstratorâ€™s proximity to the patient dilutes the effectiveness of the message. Did Isis Parenting fail because we didn't buy enough? Should Justin Bieber Be Deported?